Type-two Theory of Effectivity (TTE) provides a general framework for Computable Analysis. To refine it to polynomial-time computability while keeping as much generality as possible, Kawamura and Cook recently proposed a modification to TTE using machines that have random access to an oracle and run in time depending on the “size” of the oracle. They defined type-two analogues of P, NP, PSPACE and applied them to real functions and operators. 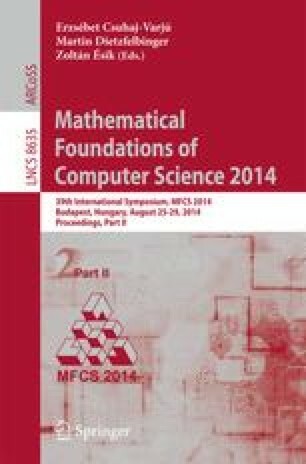 We further refine their model and study computation below P: type-two analogues of the classes L, NC, and P-completeness under log-space reductions. The basic idea is to use second-order polynomials as resource bounds, as Kawamura and Cook did, but we need to make some nontrivial (yet natural, as we will argue) choices when formulating small classes in order to make them well-behaved. Most notably: we use a modification of the constant stack model of Aehlig, Cook and Nguyen for query tapes in order to allow sufficient oracle accesses without interfering with space bounds; representations need to be chosen carefully, as computational equivalence between them is now finer; uniformity of circuits must be defined with varying sizes of oracles taken into account. As prototypical applications, we recast several facts (some in a stronger form than was known) about the complexity of numerical problems into our framework.